To keep the cabbage’s flavor and color bright, add a little vinegar just before serving; the pigments that color the cabbage interact with acidic ingredients. For a pronounced juniper flavor, mince half the juniper berries after cooking and stir them into the cabbage before serving. And leftover cabbage makes a delicious addition to a ham and Gruyère sandwich. Melt butter in large skillet (at least 12 inches wide) over medium heat. Add onion, thyme, juniper berries, bay leaves, and a generous pinch of salt; cook, stirring occasionally, until softened and just beginning to brown, 8 to 10 minutes. Stir in the diced apple, then add the cabbage, handful by handful, and stir into the onion mixture (all of the cabbage may not fit in the pan at once). Cook, turning the cabbage from the bottom of the pan to the top, until cabbage is soft and wilted, 15 to 17 minutes. Add vinegar, apple cider, and brown sugar; stir to mix. 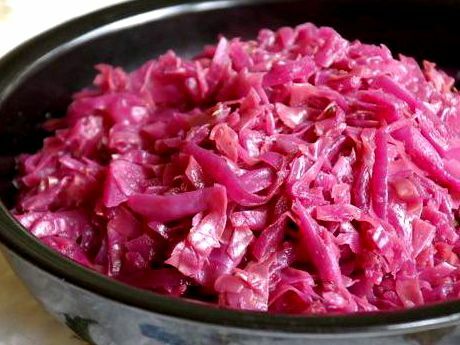 Cover, reduce heat to medium low, and cook, stirring occasionally, until cabbage is very soft, silky, and vibrantly colored, about 45 minutes. Increase heat to high and cook until juices are reduced and pan is almost dry, about 5 minutes. When ready to serve, remove juniper berries and bay leaves and adjust seasoning, adding additional salt, pepper, sugar, and vinegar to taste. Need more suggestions for side dishes? Read Matthew Card's story about vegetable sides that travel well.